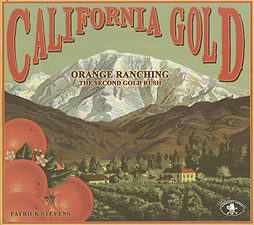 California Gold is an historic simulation of orange production where you represent a co-op for helping orange ranchers receive support and the best prices for their crops. Play hinges around collecting cards that represent orange ranches. Buildings, such as packing houses and nurseries, create local support structures, while railroad contracts and advertising increase profits. Working conditions, weather, and politics compound the challenges.